“Law?” I inquired. I admit I sounded skeptical. Possibly scornful. Ah, the question of the moment, wherever you go, at home, on the road… Bags. San Francisco banned plastic bags in 2007. 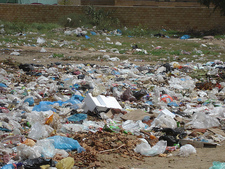 Los Angeles ducked the issue in 2008, because the plastic bag lobby convinced them civilization would collapse. China, the oldest civilization around and not collapsed yet, banned the infernal things, hoping to curb the proliferation of them as neo-prayer flags hanging on trees, wires, fences and such, which is what I saw when I was there three years ago. And now my home city, Seattle, is about to vote whether to impose a 20-cent charge on bags. This has riled the plastic industry, which dumped a million bucks on convincing us Left Coasters that free plastic is essential to life. Like credit cards, only stretched out.